A block from town, a block from the beach: 3 BRs, 1 bath; wireless; $625/week. One block W. of marina. Sharp 3 bedroom, 3 bath, washer/dryer. Sleeps 8. Awesome view of harbor from living room, kitchen/dining room, and master bedroom. Call Patti Fogg (616) 399-5067. Exciting cottage with view of High Island from large deck. Open floor plan, huge windows on extremely private beach. 2 BRs with 2 full beds + loft with 2 twins. 1½ baths, TV/VCR, W/D, microwave, gas grill, all amenities. $1200/week; spring & fall $895. Limit 6 people. Please call (941) 921-2233 or (317) 769-6563. Charming beachfront cabin nestled in the woods 50 yards from the water, 4 bedrooms, 2 baths, full kitchen, washer/dryer, queen beds in 3 rooms with two sets of xl-bunks in the 4th. Satellite TV. Perfect for families. Rent per week is $1,000. Security deposit. Available June – September. 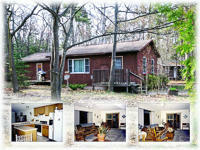 Secluded Beautiful Chalet on 10 Acres of pine with 360' of sandy Lake Michigan Beach. 2-BR (including loft), one bath, Great Room with 2 sofa sleepers. Fabulous views of the Lake. Large decks. Sleeps 7. Across from state land and hiking trails. No smoking. Dogs allowed. $800 per week. Call Ty Eicher (810) 397-7428. For Rent: Main St. 3300 sq. feet. 5 Bedrooms. 3 Baths. In-Town. ½ block from public beach. Responsible parties only. Reasonable. Call for info, Kathleen Wood, (231) 448-2311 Home (231) 598-1119 Cell. Great location in town and perfect view of the Harbor overlooking Veteran's park. Sleeps 8 - 10 with 2 full baths. Full kitchen, washer/dryer, many amenities. $900 a week. Call for more info or pictures. 231-448-3038. Large rental home, available year-round. Great for multiple families and groups. Waterfront location overlooking Harbor entrance. Adjacent to Natural Area, and surrounded by woods. Secluded, yet easy walk or bike ride to town. Unique barnwood post-&-beam construction. Large windows to bring in light and the outdoors. 3 full baths, 4 bedrooms. Sleeps 12 in 2 king and 10 twin beds. Bedroom layout comprised of one bedroom with a king bed and master bathroom (including 2-person shower and Jacuzzi tub) on first floor, a second king bed in a bedroom on the second floor, plus another bedroom on the second floor with two sets of extra-long twin bunk beds, and a third bedroom on the second floor with two sets of extra-long twin bunk beds and a regular twin bed. Another twin bed is located in the third floor loft room. 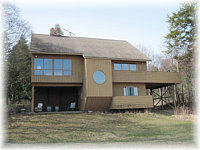 House is 3 floors, with spacious first and second floor decks facing Lake Michigan. Second-floor TV room with wet bar, DVD/VCR and DishNetwork. Large fully-outfitted kitchen with breakfast bar and two sinks. All new appliances including dishwasher, washer/dryer and outdoor grill. Bed and bath linens provided. Clean, well-mannered pets considered. $1800.00 per week, reduced off-season rates. Call Jan and John Terry for details: (989) 560-8639. 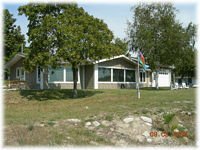 Lake front "The Last Resort" 2 BR house on Sand Bay, great view, beautiful sunrise, laundry pair, 1 ½ bath. Phone Bill McDonough at 448-2733 (days). 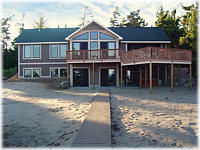 Located about four miles from town on the beach of Sand Bay. Three bedrooms, two with double beds, one with two twin beds, one and a half bath, washer and dryer, full kitchen, gas grill, large deck that you step off onto the beach, gas fireplace, dish TV and VCR/DVD player, and a gorgeous view of Lake Michigan. Reduced rates for June, September, and October. For rentals, call Bill or Tammy: (231) 448-2733 or (231) 448-2499 or email tammymcd107@yahoo.com. Beaver Island is the landing for your next adventure. Our goal is to make your island experience all you dreamed it would be. RRMS cares for every cottage, cabin, and home as if it was our own and we will do whatever we can to help make your time on Beaver Island wonderful. As full time residents, we are able to offer all kinds of tips and recommendations for fun outdoors or in the community. 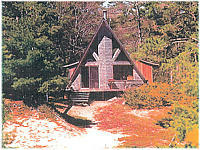 It is our pleasure to assist you in securing your dream vacation spot on Beaver Island. Beautiful Harbor View. Sleeps 15. 7 Bedrooms with sinks. Fully-equipped kitchen. Beach access. Great for multi-family groups, family reunions, business retreats. Open year round. Weekly rental, Saturday to Saturday, in season. 3-night minimum off-season. Spectacular view of Paradise Bay! Large home with all the amenities, linens provided. 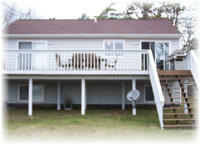 4 bedroom, 2 ½ baths, sleeps 8, washer/dryer, fully equipped kitchen, satellite tv. June – Sept. $1250 a week. Short walk to the Stoney Acre Grill. Please call 231-448-2235 for reservations or more details. Weekly or Daily Rental when available: Located close to the marina with a large yard and great view of the St. James Harbor. 2BR (Full/Twin bunk and a Double) also has a large loft with 2 Twin beds. Washer, dryer, linens furnished, and Dish. Ferry pick-ups available. 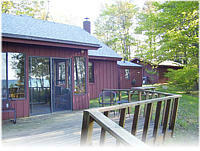 Leave your cares on the mainland and enjoy your stay on Beaver Island in this cozy town home. Kid friendly and pets welcome. Call (231) 838-2883 or (231) 620-3304 to make your reservation. One block from Harbor. Sleeps 5-6. All appliances incl. Laundry. $600 per week. Off season rates NO pets. No Smoking. (614) 899-9922.
from a great “in-town” trailer. Perfect for a couple of working people. 2 bedroom, 1 bath. Furnished and fully equipped kitchen. $1500 a month. Please call (231) 448-2235 for reservations or more details. Located on Sand Bay, beautiful Lake Michigan waterfront home, available summer of 2006: 3 bdrms; sleeps 8; 2 full baths; w/dry; full kitchen, including dishwasher and micro; wonderful sunrise views with sandy beach & safe swimming, screened porch & large deck, everything included. Prime weeks open. Call Nancy: (810) 227-2366 nrosso@hotmail.com. 3 BR 2 bath Home; sleeps 6; many amenities. $980 a week. Reduced rates for off-season. Phone (313) 885-7393, after 4:00p.m. 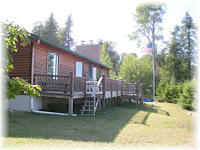 Log Cabin on Sand Bay For Rent. 2BR, two bath cottage that now sleeps 6-8 comfortably with the upstairs renovations now complete. The cottage is in town on a quiet back street on Lake Michigan. Enjoy the sunset, the beach and the closeness to town all in one location. 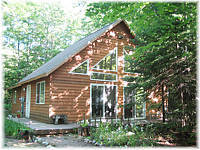 Contact Sue at cabinbythelake1@gmail.com $ 750/week. On the east side. Available by the week or weekend. One BR, full kitchen and bath. Enjoy the water and the woods, year round. Off-season rates. Complete privacy. (231) 448-2907. The best places to stay on Beaver Island. Contractors, Construction, Remodeling, and Materials. A great variety of Professional Services available on the Island. 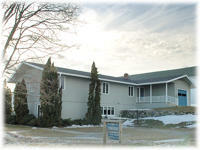 Beaver Island Organizations and useful Links. Looking for property or a home on the Island? The best places to dine on the Island. How to Get to Beaver Island and how to get around on the Island, including rental vehicles and charters.